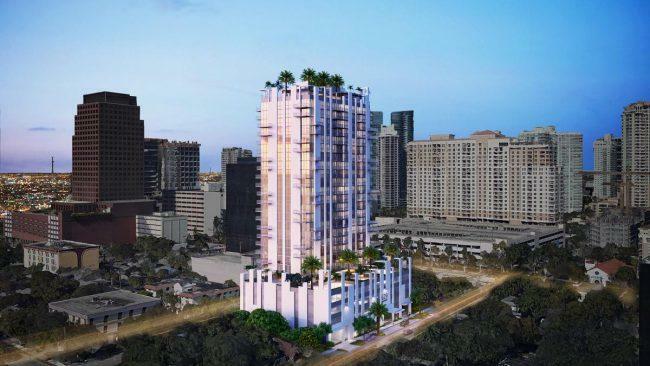 UPDATED, April 8, 10:10 a.m.: Developer Dev Motwani won city approval for a 34-story, 246-unit apartment building in Fort Lauderdale that will target older tenants. Motwani would market the rental development at 629 Southeast Fifth Avenue, called 629 Residences, to seniors, but the property technically won’t be age-restricted. Monthly rents would range from $1,800 to $4,000. The project effectively won final approval on Tuesday when Fort Lauderdale commissioners endorsed preliminary approval of 629 Residences by city staff on March 12. Kobi Karp Architecture & Interior Design designed the project. The site of 629 Residence is just south of the Broward County courthouse parking garage and just north of the location of a controversial development proposed by an organization called the AIDS Healthcare Foundation.